Learn how to send and receive SMS messages using a MySQL database with Diafaan SMS Server. Get instructions about the installation of the ODBC driver, create the database with an SQL script and how to connect to the database with the connection string for MySQL. MySQL is one of the most popular database programs available. 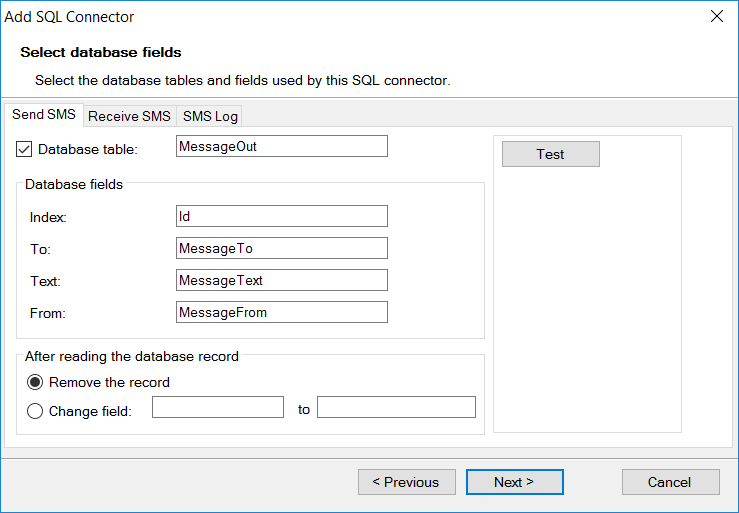 Diafaan SMS Server can use an ODBC driver to connect to MySQL. For this article MySQL version 5.0.88 was used with the MyODBC 5.1 driver. Before Diafaan SMS Server can send and receive SMS messages from the database you have to make sure the MyODBC 5.1 driver is installed on the computer running Diafaan SMS Server. You can find the MyODBC driver on the MySQL website. Note: Diafaan SMS Server is a 32-bit program and requires the 32-bit version of the ODBC driver, the 64-bit ODBC driver will not work. Windows supports both 32-bits and 64-bits versions of the ODBC drivers at the same time. The 32-bit version of the Windows ODBC manager is located at "%systemdrive%\Windows\SysWoW64\Odbcad32.exe" on 64-bit versions of Windows. For more information see Access your database.